Years after the Alien tetralogy's conclusion, acclaimed director Ridley Scott returns to the saga he created and the genre he mastered with his latest film Prometheus. Not so much a prequel as a new narrative established in the same continuity, this new science fiction blockbuster intertwines the origins of the infamous extra-terrestrials whilst creating it's own unique and thorough storyline to expand this vast universe. In 2089, the starship Prometheus lands on a distant terrestrial planet which archeologists Elizabeth Shaw (Noomi Rapace) and Charlie Holloway (Logan Marshall-Green) claim has answers for how the human race came to be. However, their thirst for knowledge eventually threatens them all when a species of biological killers attacks the crew, forcing them to fight a horrifying battle to defend the future of humanity before it's too late. Striking visuals are consistent throughout. Though CGI is not used to a great extent, everything looks believable and atmospheric, making for a film that looks crisp, polished and extremely pretty. The cinematography emphasises the scale of this intergalactic universe, with sweeping wide camera shots and intimate detailed close ups. Practical effects employed throughout are equally as impressive, and when the time comes for necessary use of CGI, it's just as realistic and pleasing to the eye as the rest of the film. With 3D cameras employed in production, Prometheus exudes a very clean if conservative 3D effect with ghosting and other visual glitches absent. The score by Marc Streitenfeld communicates a sense of mystery and majesty and slots into the film scenes perfectly, most notably in the beautifully shot introduction. The narrative feels a bit flimsy initially, with the opening scene appearing rather vague even by the time the end credits roll. Stuff happens a bit too fast, or feels a little forced, and some of the characters are shunted aside too soon - the consequential lack of development renders some of them meaningless and uninteresting, though fortunately most of the characters truly prominent to the story do not suffer from this. As the narrative unfolds, a lot of clever twists are conjured, and many revelations take place to further piece together the puzzle, if you will. The entire plot structure feels extremely satisfying and intelligent, making for a film that sparks enjoyment in the audience by allowing them to piece everything together with the main characters. Is it grim? You bet it is. A handful of the events that unfold can be emotionally saddening and extremely dark, and in terms of gore a decent balance is met. There is certainly no abuse of blood or internal organs, but there is a plethora of disturbing moments that will have you on the edge of your seat; those expecting a scare equivalent to the chestburster in Alien, however, will leave the cinema underwhelmed. A strong cast made up of some big name celebrities such as Michael Fassbender and Charlize Theron also increases the drama and emotional intensity. Particularly with Noomi Rapace and Fassbender, the acting is universally impressive and works in conjunction with the narrative and events to anchor the serious atmosphere; never are the performances silly or over the top or too bland that they disrupt the realism. Charlize Theron is impressive in her role, but her character is plain and, by the end of the story, seemingly underdeveloped and almost useless. 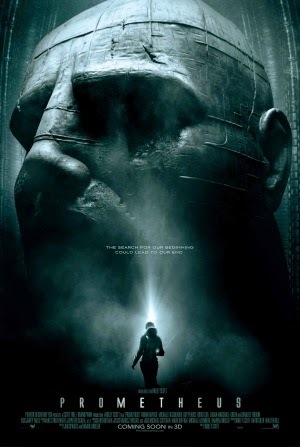 Prometheus is a film that demands a reasonably intelligent audience who can understand and flow alongside it's complex albeit satisfying narrative. It distances itself from the Alien franchise well enough to feel fresh and original, yet cleverly brings in references to the it's acclaimed predecessors (or successors in a story sense) which are more than just clever nods; more backstory. It has it's problems which weaken the flow of things, but with stunning visuals and fantastic acting alongside it's gripping plot, Prometheus comes highly recommended.